PVCC men gather every other Friday for a Men’s Breakfast at Chick-fil-a in Noblesville (SR 37). The group is currently reading through the Gospel of Matthew, with Joe Fenimore leading our discussion. Check the “Events” tab above for more details about our next meeting! The point of each Men’s Breakfast is to catch up, pray for each other, encourage each other, and study the Bible together. All men are welcome! Periodically, we hold fellowship events outside of our regular Men’s Breakfast. These are great opportunities to meet other men in our church, and have some fun in the process. Check the “Events” tab above for more information about our next event! For information about our Men’s Ministry, contact Ben Halliburton. On Thursday nights in the Fall and Spring, our Women’s Ministry puts on a bi-weekly study at the church. The study begins at 7 PM, located at PVCC. Olivia Halliburton leads discussion. During the summer, our Women’s Ministry takes a break from their regular study and focuses on fellowship. Check the “Events” tab above for information about the next event! For information about our Women’s Ministry, contact Olivia Halliburton. Several times throughout the year, we invite the people of our church to come together and pray for our church, our community, our world, and each other. These events typically occur on Thursday evenings at PVCC. For information about Prayer Nights, contact Ben Halliburton. Every year, we have a friendly competition to see whose NCAA Tournament bracket is the most accurate. This usually includes an event in early March with food and fellowship. 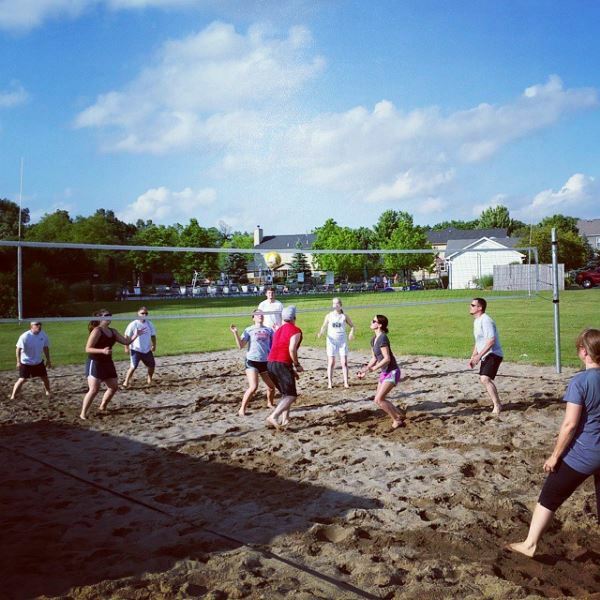 Throughout the Summer, we invite people to play volleyball with us on Monday evenings. Players can be young or old, experienced or inexperienced – we’re mainly there to have fun! Games are played at 6:30 and 7:30 PM, but you’re also welcome to come and watch! In the Spring and Fall, PVCC fields a coed softball team in the Fishers Parks and Recreation League at Holland Park. Games are played on Sunday afternoons. In the Fall, PVCC has a Fantasy Football League for all who enjoy playing. This has been a great source of laughs, as well some good-natured smack talk. For information about our Sports Ministry, contact Craig Hunter.